This page explains the different types of Awards provided by A' Design Award & Competitions. A design which gets a highest score is a winner of the "Platinum A' Design Award - No.1", there is only one given. 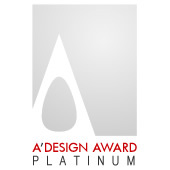 This award corresponds to the first place and owners of this award can use the Platinum A' Design seal. A design which gets the second highest score is a winner of the "Platinum A' Design Award - No.2", there is only one given. 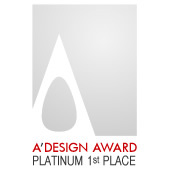 This corresponds to the second place and owners of this award can use the Platinum A' Design seal. Notes: If there is only one platinum winner, this place is considered the first. If more then more platinum award winners, the first 3 as ranked at A' Design Award webpage are ranked accordingly as first, second and third place. If there are not any platinum award winners, the gold award is considered the 1st place, and the ranking follows the platinum one (please note that, the platinum 1st place logo cannot be used at this point). This principle also applies for silver and bronze awards as well. Finally if a category has only A' Award Winners (i.e. if platinum, gold, silver or bronze awards were not given), in this case, the academic rankings do not apply. A design in top (10% < 20%) is a winner, and gets the A' Design Award. This corresponds to honorable mention. Note: For World Design Rankings, this award is considered "Iron". This Award is the standard A' Design Award. The word "IRON" is replaced with "WINNER" when displayed at your profile pages. Given to countries with winner participants. Can be freely used by the eligibile parties for their communication and advertising campaigns, year must be indicated. Given to companies with winner employees. Given to faculties with winner students. Given to instructors with winner students / apprentices. 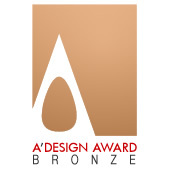 All awards can be used as a seal of excellence for products, designs etc. Each award has an academic matching. All the designs that recieve the award will be published in the annual book. 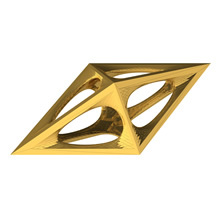 Please be reminded that the award percentages would be less in years where there are substantial number of entries. 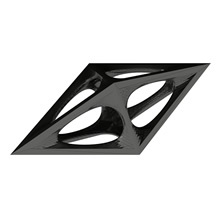 Furthermore please be reminded that the trophies listed in this page are renders. Actual trophies are slighly different and are 3D printed in metal with smoother interiors. 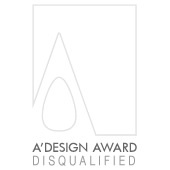 Please do kindly note that the A’ Design Award voting system does not permit awarding of entries which are below a certain score even though these entries would be in the top 30% after all entries are voted for. This explains the discrepancies that could occassionally occur in the number of winners’ percentage to number of participants which is usually less than the 30%. This base score methodology was introduced in early 2010 to ensure that only the entries that meet the standard for international recognition would be awarded. Likewise, the counter principle is usually respected and the number of awards could be expanded, be potentially higher if all entries would be extremely competitive in terms of their design qualities. Furthermore, being the first in a category does not result in a Platinum award either. The reason is as follows: The A' Design Award and Competition voting mechanism ranks entries not based on purely on their average score, but using a sorting function that considers the normalized z-score, standard deviation of juror scores, weight of juror scores for criterias, weight of category scores, variance of scores which are calculated within the category but also with respect to all other entries in all other categories, given this score calculation, the implication is that even if your category would have only 1 entries, it is not obliged to be platinum award winner nor it would not be considered the worst in the category (because you would imagine if there is one entry, it is the best and the worst which of course does not make sense), thus a comparison of the calculated score is compared to other categories, in this case the entry being the first place within a category does not imply a platinum award level nor a participant (non-winner) status. 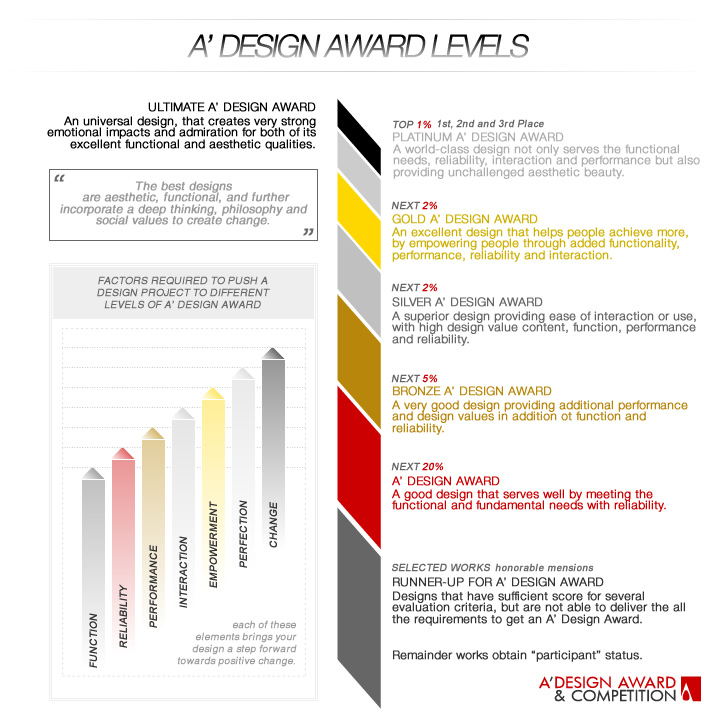 Furthermore there are additional requirements for award levels, for instance the platinum award level requires that the entry is in top 1% in its category, plus with respect to all other designs, it has a significantly high score (significance is decided on how far the average score of this entry is away in terms of standard deviation to other entries) plus majority of jury members should have up-voted it, up-voting means that majority of jury members would vote significantly higher than their average for that design (again significance is based on their standard deviations). Please also see: benefits for winners, winners services and winners pack.